Five NEW soldering station kits for the price of three? It’s true! 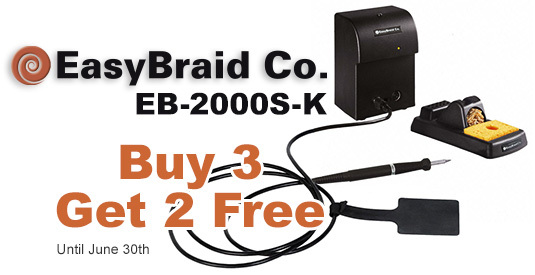 Get 2 FREE EasyBraid EB-2000S-K Soldering Station Kits when you purchase 3. This limited time offer expires on June 30th, 2015. The EB-2000S-K is a brand new soldering station based on Curie Heat Technology. This technology responds to the thermal needs of individual solder joints by fine-tuning the power immediately, thus meeting the precise requirements of the substrate components and solder materials. Surface Resistivity: 105 – 109 Ω/sq. Here’s how to take advantage of this FREE promo: Visit QSource.com to make your purchase and then download the redemption form from our site. Complete ALL FIELDS with your contact information. Send the completed form and a copy of the invoice to either sales@easybraidco.com or via fax to 952-929-2765. Please note: Invoice must be dated between 4/1/15 and 6/30/15, redemptions must be postmarked within 30 days of the distributor invoice date, and customers are responsible for all shipping charges of the free soldering stations (must provide a UPS or FedEx account number). For further information, you may contact Q Source by phone (800-966-6020), email, or via our Web site.